Become a part of an international network of pet shippers! When your company joins IPATA you become part of an international network of pet relocation specialists who work together to provide professional pet transportation services worldwide. The International Pet and Animal Transportation Association (IPATA) is a non-profit trade association of independent members who are dedicated to the safe and humane transport of pets and other animals. ​Active members are included in a public directory where customers may search for a pet shipping professional by airport, country, and species. You will be recognized as a qualified and trained professional in the pet transportation industry. Complimentary media relations consultation and tools for increasing your SEO. Join IPATA on social media and spread word of your company and services. Social media networks, group email system just for IPATA members and regional/annual meetings. Ask your questions, learn from others, share stories, set up one-on=one meetings with AVI reps, government officials and pet industry suppliers. Training tools to improve your skills and the skills of your employees. 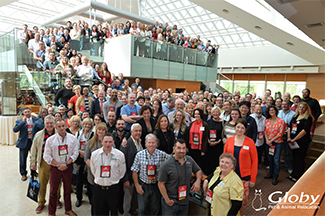 On-line and in person at regional meetings and the annual international conference. Direct link to airline AVI representatives and government regulatory offices around the world, many of whom you will be able to personally meet at the regional and/or annual meetings. A database of important health requirements for over 200 countries including forms and tips from other pet shippers. Discounts on microchips, crates, the IATA Life Animals Regulations (LAR) Manual, lab testing and more. In-depth checks on new applicants and increased requirements before membership is approved. Expected compliance with and respect for internal Code of Ethics to protect members and the general public while raising the bar on the quality of services that can be expected from IATA's professional pet shippers. Direct link to professional pet shippers providing destination services at over 600 airports around the world - all ready to hep you with your shipments to their area. Guidelines and pet shipping resources such as tips of shipping other species, dealing with the media, country restricted breeds, customs hours and much more. Get up-to-the-minute answers to your questions, airline updates, and international regulation changes. When your company is a member of IPATA it is a member of a dynamic, non-profit organization that constantly and consistently gives value to its membership and to its mission both of which are 100% oriented to the welfare of animals. Pet Relocator: "IPATA helps us grow!" "Being a part of a reputable organization such as IPATA, puts your customers minds at ease that you and your network of peers are the industry experts for animal transport. While we specialize in mostly personal pets, IPATA members don’t stop there! They ship all sorts of animals from rescue organizations to zoos. As a member of IPATA you gain invaluable insight into the safety and wellbeing of animals with our panels of experts who work for the airlines, veterinary services, and freight companies. The membership is very diverse, from small business, like us, to larger corporations that can handle all aspects of a client move all over the world. Even if we don’t have a member listed, chances are you can talk to our membership and someone can recommend an agent in that country or part of the world." "We had the pleasure of attending the Rome conference in 2015 and being a part of our largest international conference to date. It was terrific to network with our peers, put faces to names we have worked with, and to partake in the training sessions." "IPATA continues to help us grow our business, it provides valuable access to other members, industry standards, discounts, and training on how to grow and maintain your business. Our first year of provisional membership went by so quickly, we were shocked when the Administrative team emailed us to confirm our information prior to being listed on the main website." Active Members - For those actively involved in shipping pets as part of their business. Associate Members - For those who provide goods and services to the pet shipping industry such as kennel manufacturers and suppliers, airlines, insurance companies, airport holding and quarantine facilities, and governments.